The Snows of Windroven is part of the Amid the Winter Snow anthology and was by far my favorite addition to that collection. As an ardent fan of the Twelve Kingdoms world, it was about time we got to see what Ami and Ash are up to. Ami has been the most surprising character in the Twelve Kingdoms. She is the pampered princess, the one that on the surface you don’t think is interesting or could easily hate. But she is funny, she is able to look at herself and see how stupid and shallow things are, and she hides a clever and strong mind. Though is a short, you get to see Ami and Ash’s relationship progress. And they do get their HEA. It is a perfect short story. The exciting part…there is another dragon, and Ash can sense it! Call all the Tala, get Dafne on a boat, we have another dragon! 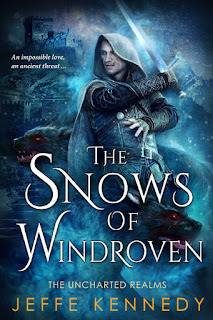 I’m crossing all of my fingers that Kennedy will bring us back to Windroven, and soon!